Dynarex does not sacrifice quality with its competitive economy line of surgical gauze. 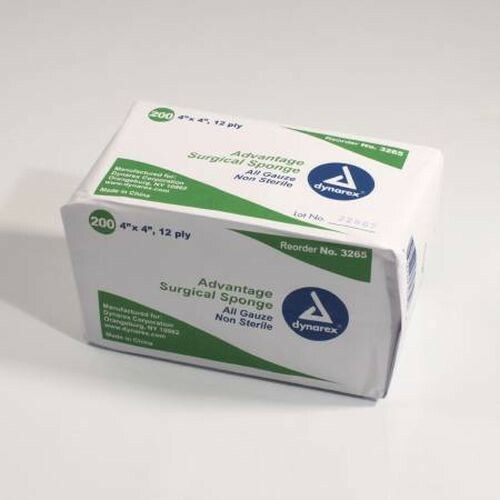 The 3265 Advantage 4 x 4 Inch, Surgical Gauze Sponges 12 Ply offers value and maximum absorption to be an ideal wound dressing or prep and clean the wound. The 12-ply cotton construction creates superior absorption and is soft and gentle to the skin. Dynarex designed the gauze sponge with the cut edges folded in to not expose any raw edges to reduce lint. Vitality Medical offers the sponges in a pack and case with additional sterile options available. You may also be interested in Bacitracin Antibiotic Ointment as a topical cream to treat minor cuts, scrapes or burns.